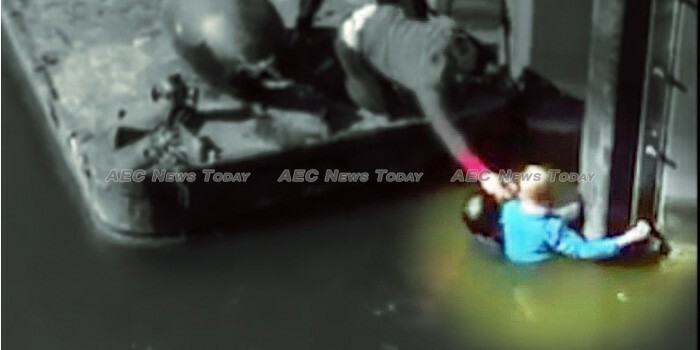 A Nong Khai, Thailand man is being hailed a hero after leaping three metres (about 10ft) into green, murky water to save a young German boy who had fallen off a pier. Ruchanon Pidtafai (ฤชานนท์ ปิตตาฝ้าย), 29, who works at Ed. Züblin AG, one of Germany’s largest construction companies, was visiting the Maritime Submarine Museum in Peenemünde, Usedom, Germany with friends when he heard a child screaming from the water. While stunned onlookers contemplated what to do, Mr Pidtafai is reported to have run to the edge of the pier with his friends and with barely any hesitation, leapt fully clothed into the water three metres (about 10ft) below. In the video above Mr Pidtafai can be seen desperately clinging to the bolt heads and nuts holding the wharf protection plates in place in order to keep the young German boy’s head above water. As some bystanders reach for a lifebuoy at the entrance to the Juliett-class U461 Cold War Soviet submarine exhibit, one of Mr Pidtafai’s friends, Sutha Onnum and a harbour worker untie a barge which is then pulled by those above to the two people in the water below. Mr Pidtafai said he “heard splashing and the young German boy calling for help. There were people shouting. We ran over and saw what was happening. I can swim so I jumped straight in, he told AEC News Today matter of factly via Facebook. “The boy was struggling at first. It was a good thing he wasn’t scared or panicking too much or it could have been worse as there was not much to hold onto” he said. Thai netizens though have been quick to rally behind Mr Pidtafai, calling for his selfless act in saving the young German boy to be recognised.